2. Potrite cream and hard cheese, butter on a coarse grater. 3. Yaytsa lightly whisks with a pinch of salt and add to the cheese and butter, leaving a couple of tablespoons of whipped eggs for lubrication test. 4. Dobavte flour with baking powder and knead bread. Should not delay the process, otherwise the oil completely melted. 5. 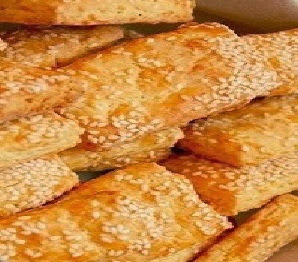 Raskatayte dough thinness of about half a centimeter, brush with egg and sprinkle with sesame seeds. 6. Porezhte and place on baking sheet. 7. Duhovku warm up 190?S and 20 minutes to send her cookies.